The following provides a high-level overview of marijuana and PTSD and answers some questions surrounding whether or not medical marijuana can help. Post-traumatic stress disorder – or PTSD – is a psychological condition that’s typically caused by a traumatic experience. Most often we talk about PTSD in relation to military combat although its onset can also occur in anyone with history of trauma. In many states, PTSD is one qualifying condition for medical marijuana use. Here’s everything you need to know about PTSD and cannabis. Research has found that a phenomenon called fear learning can contribute to many anxiety-latent conditions, including PTSD. In this phenomenon, learned fear from a past traumatic experience may trigger fight or flight reflexes at unforeseen or inappropriate times. For example, an on-tour soldier who was impaired by a bag that contained an IED could panic at the sight of similar bag in an ordinary and safe shopping center. As a result, adrenaline and stress levels surge, causing changes in the chemical centers of the brain. This, of course, can lead to a number of ill effects for any individual with such a condition. Unfortunately, most medications used in the treatment of PTSD offer just temporary relief. They also come with a host of negative side-effects. While research on marijuana and PTSD produces mixed results, a study published in 2011 on CBD showed potential for successfully treating anxiety-related disorders. CBD is the main non-psychoactive component of cannabis. It has medicinal properties and does not cause a “high”. It’s important to note, however, that medical professional strongly advise that medical marijuana – or CBD – use be directed by an experienced physician and used in combination with other therapies. One way PTSD patients can address learned fears is with exposure therapy. Exposure therapy is where PTSD patients are exposed to stimuli that trigger traumatic memories in a safe space. The goal is to desensitize the patients This process is called extinction. Some believe that CBD can enhance extinction, which could inhibit patients’ learned fears. Ingesting CBD can also decrease fear expression and disrupt memory reconsolidation which is responsible for strengthening long-term memories associated with fear. More and more, doctors are including cannabis and CBD in their treatment plans for patients with PTSD. Some states that didn’t previously allow PTSD patients to acquire medical marijuana are changing their stance because of research that support cannabis as a viable treatment. In fact, New York Governor Andrew Cuomo recently signed legislation allowing police officers, firefighters and war veterans with PTSD access to medical marijuana. As part of a comprehensive treatment plan, cannabis does have the potential to help PTSD patients. While more research of cannabis, CBD and PTSD is necessary for a conclusive answer, medical marijuana patients in several states have found the use of cannabis helpful in the treatment of PTSD symptoms. 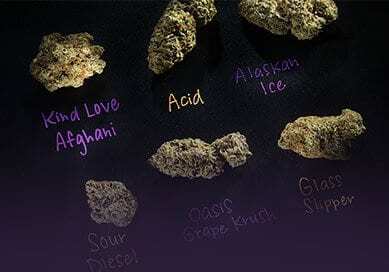 Oasis Cannabis houses the largest selection of medicinal and recreational marijuana in Denver. We feature over 100 unique marijuana strains and stock cannabis from top Colorado marijuana providers. Oasis Cannabis Superstores are also deeply committed to outstanding customer care. Our talented staff will help you select the best products for your specific needs. Visit us today.